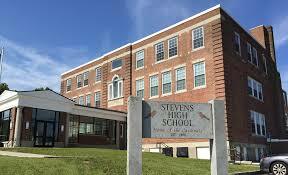 Stevens’ High School students will return to the former 4X4 block schedule from 2014 for school year 2016-17. The move comes after two offers from the Claremont School Board to the Sugar River Educational Association (SREA) to resolve the issues with the new schedule failed. On Thursday, the New Hampshire Public Employee Labor Relations Board (PELRB) issued a ruling ordering the Claremont School District to revert to the former Stevens High School 4X4 block schedule for the upcoming school year. At this time, the School Board is considering an interlocutory appeal to the New Hampshire Supreme Court. • Students’ and teachers’ schedules. •Adjust the 2016-2017 Program of Study, student handbook, core academic course sequencing, curriculum documents, and programs in place for the New England Association of Schools and Colleges Regional accrediting association visit for this October. • Also the 8% additional SHS staff compensation planned for 2016-2017 will be eliminated. This entry was posted in community, education, news, NH on July 11, 2016 by GrowingInArt. It is up to the school board to decide policy not the union or the labor board, and scheduling is policy. The union is acting childish.